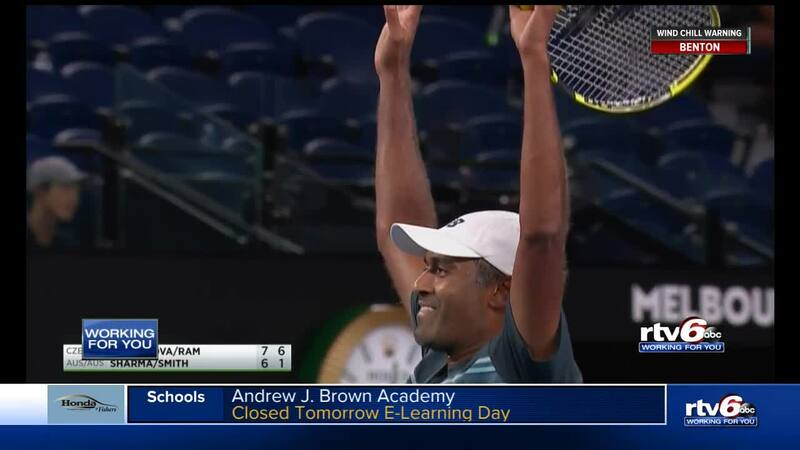 CARMEL — Back in Carmel, Rajeev Ram is already back on the court — just a few days removed from winning his first major championship. "It's pretty cool for me to think that maybe some kid is going to pursue a life in tennis," Ram said. Ram teamed up with Czech player Barbora Krejcikova to win the mixed doubles title at last weekend's Australian Open. "She's No. 1 in the world, she won two majors last year, so she brought a lot of experience to the table in that kind of situation," Ram said. At Carmel High School, he was a state champion. At the University of Illinois, Ram was a national champion in doubles. Ram's professional career is closing in on the end of its second decade. He won a couple of titles in singles play but moving to doubles turned out to be a career-changer. "I felt like if I wanted to extend my career, something needed to give," he said. "I decided to focus on doubles from now on." Ram's won 17 titles in doubles in various levels of the ATP world tour. He turns 35 this spring but with a major championship on his resume, 2019 could be shaping up to be his best year yet. "People forget real fast, we have another event the first of February," Ram said. "You start all over again. It's just really about the process, trying to improve all the time, trying to find that situation again."